Do You Remember When WBCN Was the Leader in Progressive Rock 'n' Roll Radio? WBCN catapulted the careers of the likes of Aerosmith, the Cars and U2, provided a comfy road stop for guest DJ’s like Joey Ramone, and hosted Bruce Springsteen’s first radio interview. 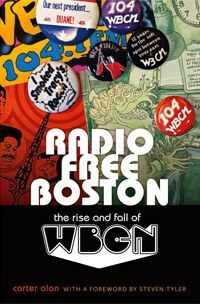 Carter Alan’s meticulously researched book, Radio Free Boston: The Rise and Fall of WBCN documents the life and death of a radio station that was a crown jewel of American progressive free-form radio, birthed in the thick of the counterculture in 1968 by lawyer/entrepreneur Ray Riepen. Riepen, who was independently wealthy, was also the publisher of alternative weekly The Boston Phoenix (itself a victim of the death of print journalism earlier this year) as well as owner of the legendary rock club the Boston Tea Party. At a time when FM radio was lively and fascinating and political, WBCN went to the next level; it was a true leader and pioneer in progressive rock 'n' roll radio for decades. For most of its 41 year lifespan, the station was the most well known brand in the Boston radio market, whether or not it commanded the top market share at the time. Even more impressively, the station served as the musical, cultural, and political voice of Boston’s youth for many of those years. Author Alan got his start in radio as a DJ on WBCN, where he stayed for 19 years before moving on to become music director across town at WZLX-FM. When the station ended its on-air days in 2009, Alan was contacted by the publisher asking if he’d be interested in writing a book about the station’s long and storied history. The counterculture had hit a fever pitch in the late '60s with anti-war protests, civil rights marches, and youth who had grown up listening to rock 'n' roll beginning to actually dictate the choices of a changing marketplace. As for WBCN’s place in all of this at that time in Boston, “We really felt it was our radio station and we were acting, in a broader way, for the entire community,” Danny Schechter AKA The News Dissector, WBCN’s famed News Director, told Alan. “There was an immense freedom,” Peter Wolf (a DJ in WBCN’s early days, pre-J Geils Band) is quoted as saying, “You were defined by your personality and your musical tastes. That was very intoxicating and exhilarating for everyone involved because you realized you were part of something incredibly new.” In fact, at the time WBCN hit the airwaves, the only place for such freedoms was college radio, which had a very small reach outside of a school’s insular community. Throughout its years the station featured larger-than-life radio personalities such as Charles Laquidara, Mark Parenteau, Ken Shelton, and Oedipus. For those who lived in the listening area, which I did in the mid- to late '70s, the station was more like a religion than mere numbers on the FM dial. Everyone in Boston listened to WBCN; everyone knew what the station was playing and who and what they were talking about. It’s difficult to imagine this kind of reach now, with niche internet music portals like Spotify and Pandora catering to individual whims. It was true word-of-mouth before the internet made the world a whole lot smaller. As popular music and pop culture itself began to morph in 1981 with the advent of MTV and became, more than ever, a vehicle for targeted advertising, WBCN’s days – as well as progressive radio in general -- were numbered. The station had catapulted the careers of many an iconic band (Aerosmith, the Cars, U2), provided a comfy road stop for many guest DJ’s in the wee hours of the morning (Joey Ramone, for example) and hosted Bruce Springsteen’s first radio interview in 1973, but it was losing its relevancy. Like most other radio stations in the 80s, it became all about the ratings, market share, and advertising dollars. Still, even with the changes looming in broadcast media set in motion with MTV, and with industry behemoth Infinity Broadcasting adding WBCN to their stable, the station managed to keep creativity in the mix for their on-air personnel. At this point it could no longer be called “free-form”, but DJs still had some say in what was played. They also managed to provide an on-air framework for the political voice of the community even as late as 1985 when an entire commercial-free day was devoted to apartheid awareness in South Africa. WBCN, which in its early days prided itself on turning down ads from napalm manufacturer Dow Chemical, accepted and welcomed all advertising at this point in its lifespan – a fact which makes the South Africa awareness day that much more remarkable. Shock radio and screamingly loud, moronic morning shows sounded the death knell for WBCN as the '80s wore on, eventually leading to the station adding Howard Stern because, well, ratings and market share don’t lie. Alan doesn’t stint in the telling of this tale. Besides the interviews that he conducted with just about everyone who mattered in the history of the station, the book takes readers into closed-door meetings where policies were created and destroyed as well as providing a fascinating look into the world of rock music programming both when it was dictated by music fans from the heart and later when the playlist originated from machines. Even more than a story about one radio station’s life and death, this is also the story of many of the finest moments in the life of free-form radio. “At its best,” writes Alan, “WBCN represented what a community of believers, not preoccupied with testing the limits of personal gain, could accomplish. At its worst, the station found itself swept out of that humble place and down the inevitable road of capitalism, losing its innocence as it slid toward a desired stock price at the end of the rainbow. WBCN went from Baltic Avenue to Boardwalk with hotels on it, and it wasn’t a pretty end, but there was magic created all along that 41 year ride past “Go.” That’s why this book is here: to pull out some of that magic before we all begin to forget it.